UNION DE ESTUDIANTES CHICANO E INDIO EL LABERINTO VOL. VI No. 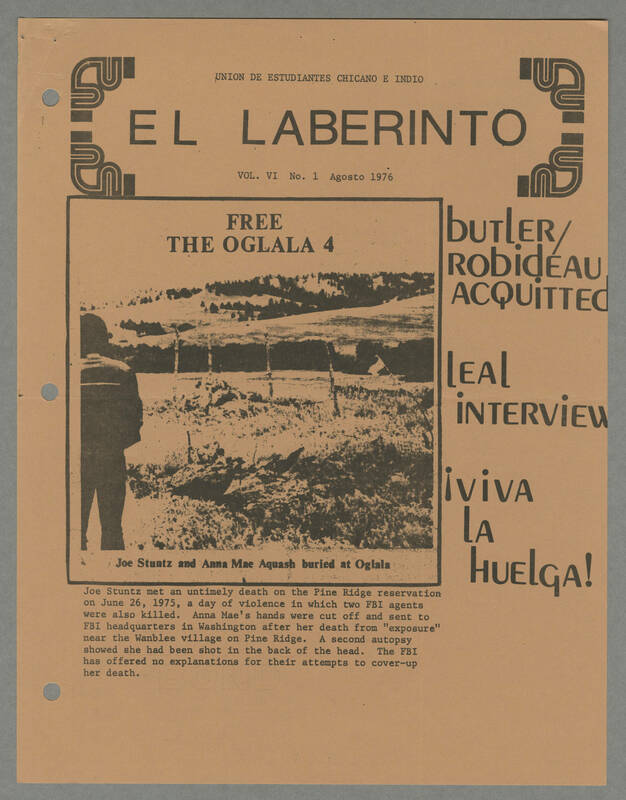 1 Agosto 1976 [[Image text]] FREE THE OGLALA 4 Joe Stuntz and Anna Mae Aquash buried at Oglala [[end image text]] Joe Stuntz met an untimely death on the Pine Ridge reservation on June 26, 1975, a day of violence in which two FBI agents were also killed. Anna Mae's hands were cut off and sent to FBI headquarters in Washington after her death from "exposure" near the Wanblee village on Pine Ridge. A second autopsy showed she had been shot in the back of the head. The FBI has offered no explanations for their attempts to cover-up her death. butler/robideau acquitted leal interview [[upside down exclamation mark]]viva la huelga!